Few topics these days are garnering as much discussion in the agricultural and biological research sectors as the worldwide shortage of bees. Honey bees pollinate approximately one third of the world’s food and pump at least $15 billion each year into the U.S. economy alone. Pollination occurs when bees and other insects land on a flower and stick their heads in to drink the nectar. As they do, their bodies transfer pollen from the (male) anther to the (female) stigma, a tube in the center of the flower. There, the ovule, which is part of the flower’s ovary, is fertilized and becomes a seed inside the fruit. The more fertilized seeds that end up in the berry, the larger the berry becomes. If the flower is not pollinated enough times, the fruit will remain small. It is already known that if the bee population continues to decline the human population is going to face an unprecedented food shortage, and farmers will face serious economic repercussions. These were already felt by some Fraser Valley blueberry growers in 2013 when they were unable to place bee colonies into their fields because of the shortage. 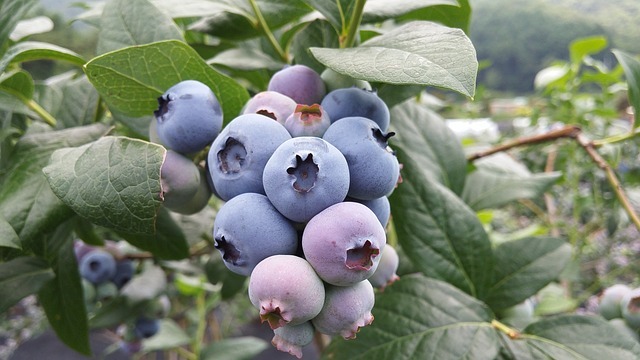 This trend is likely to continue for a few years since the demand created by the many new blueberry plantings in the last few years has surpassed the supply. However, blueberry growers can take steps to ensure adequate pollination. Have a good relationship with your bee provider and always check that you are receiving healthy hives. The BC Ministry of Agriculture recommends using between 0.5 and 2.5 hives per acre depending on the blueberry variety. Different varieties can have different flower shapes and other factors that contribute to bees having a preference for one variety’s flowers over another. It has been shown that Duke flowers have a wider floral opening than Draper and Bluecrop, and thus receive more pollination visits and respectively higher yields. This was demonstrated in a study by SFU researchers in 2011-2012 and presented at the Lower Mainland Horticultural Improvement Association (LMHIA) Growers Short course. A study recently published by Michigan State University showed that adding some wild bee habitat on the edges of the blueberry field can increase the abundance of native bees in the neighbouring crop. They found that yields started to increase around two or more years after the increased flower visits by the wild bees. Also importantly, they found that the investment of planting wildflowers to create the wild bee habitat paid for itself within four years. This study is highly encouraging, and would be a good candidate for local testing. When bees are moved to a new location, they actively search for new nectar sources. When individual bees find one they keep visiting it until that source is depleted. If the honey bees are brought in too early, they may learn to forage elsewhere instead of on your bushes. 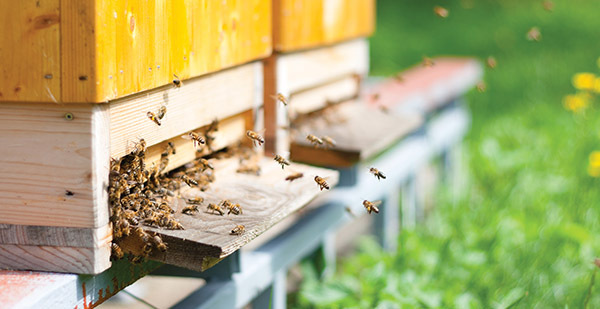 The proper time to place bees in the field is between 5% to 15% bloom. This takes proper planning and pest monitoring before and during bloom. Thoroughly discuss all options with your crop consultant and bee keeper. DON’T MISS another issue of Modern Agriculture Magazine! SUBSCRIBE today for FREE (Canadian addresses).